Small handmade batches of cold processed soap made with olive, coconut, palm and organic soybean oil, lye, essential oils and botanicals, 5-7 oz each. Our organic eye pillows have an organic cotton and/or a hemp silk blend cover (hand washable) and an organic cotton pillow that is filled with organic flax seed. The pillow can be unscented or scented with dried lavender. 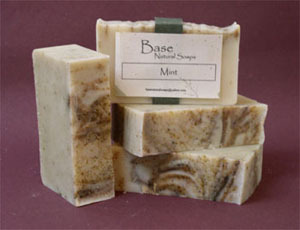 Custom soaps and custom labels also available. Find us at a local Craft Fair, on Etsy or e-mail/call Base Natural for orders.